On August 17, 2017, the City of Antioch filed an action against the California Department of Water Resources challenging the Final Environmental Impact Report for the proposed California WaterFix Project – e.g. the Delta Twin Tunnel Project. The City’s action alleges the Final Environmental Impact Report violates the requirements of the California Environmental Quality Act (CEQA). In the action, the City describes some of the significant impacts from the Project to Antioch’s water supply and notes that such impacts remain unmitigated. Among the unmitigated project-related adverse impacts to Antioch are increased salinity levels at Antioch’s intake in the Delta. The City’s Petition further describes how the WaterFix Project’s proposed operations remain largely undefined, making it difficult to determine the full extent of the impacts from the Project on the Delta. The City further contends that the WaterFix Project violates the dual goals of the Delta Reform Act of 2009 which required projects to reduce reliance on the Delta. 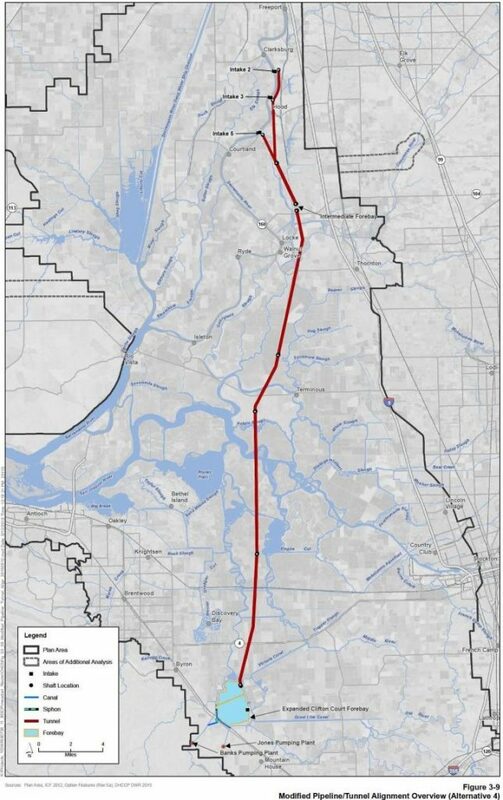 Instead, the WaterFix Project, as presently proposed, will allow for the diversion of more water from the Delta including the diversion of much fresher Sacramento River water before it ever flows into the Delta. Antioch as a city depends on the Delta for its quality of life, its drinking water supply, recreation and economic future. As one of the largest cities located entirely in the Delta, Antioch has been closely aligned with the protection of the Delta and its restoration. WaterFix is in conflict with both of these critical goals. The City expects to work closely with other public agencies and environmental groups in opposing the Final Environment Impact Report for the WaterFix Project. Congressman Mark DeSaulnier (CA-11) will host a town hall meeting at Concord High School on Wednesday, August 9th at 6:30 p.m. Since assuming office in 2015, Mark has hosted 46 town halls and mobile district office hours throughout Contra Costa County. Congressman DeSaulnier invites residents to attend the town hall to listen to a presentation and legislative update. During the town hall constituents will have an opportunity to ask questions, share their opinions on actions taken by the Administration, and discuss issues important to their communities. Please RSVP online at www.desaulnier.house.gov/town-hall-rsvp or call 925-933-2660. For more information or to request ADA accommodations contact Congressman DeSaulnier’s office in Walnut Creek or Richmond. 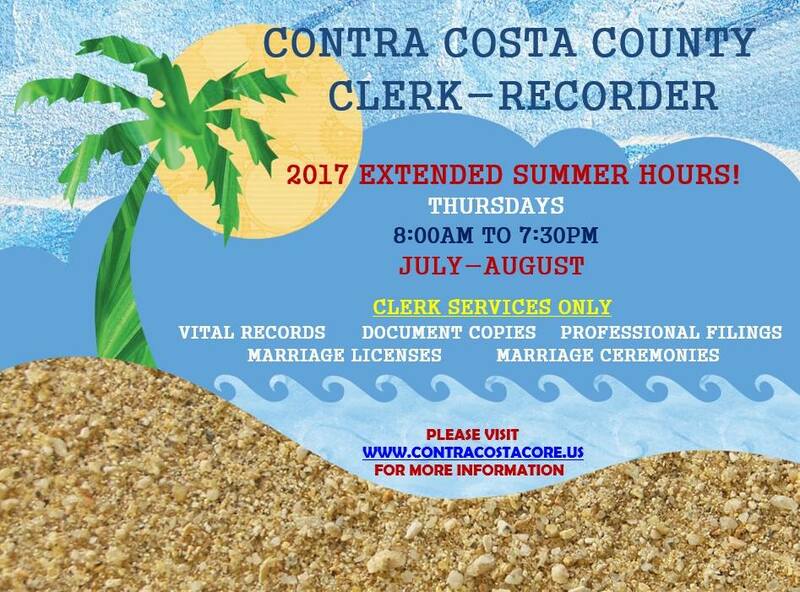 Summertime in Contra Costa County means two things: warmer temperatures and the Clerk-Recorder’s office being open late on Thursday nights. So, now you can get hitched without missing work! Every Thursday between July 6th and August 31st, the Clerk Recorder Division office, located at 555 Escobar Street in Martinez, will be open from 8:00 am to 7:30 pm, a welcome three-hour extension to the usual closing time. Summer is an important time for parents to obtain birth certificates for school and those seeking documents for traveling. It is also a popular season for weddings. “We want to provide a courtesy for our residents, especially those who work during the day and find it difficult to make it to our office before 4:30,” said County Clerk-Recorder Joe Canciamilla. Services provided during the extended hours include the issuance of marriage licenses, copies of vital records such as birth and death certificates, copies of recorded documents, fictitious business name and other professional filings. Marriage ceremonies will also be available by appointment and walk-ins accommodated if possible. Document costs are available on the Clerk-Recorder website at www.contracostacore.us. The Extended Summer Hours program debuted in 2015 and proved to be even more popular in its second year. By holding longer hours in the summer season, customers are able to take advantage of the extra daylight. 368 customers were assisted during extended hours last summer, a nearly 50 percent increase over 2015. Marriage services accounted for almost half of those transactions. For more information or to make an appointment, call 925-335-7900 or visit www.contracostacore.us. The Contra Costa County Board of Supervisors met Friday, June 23, 2017, to determine the process for filling the vacant office of the District Attorney. When a vacancy occurs in an elective county office, the Board of Supervisors has the responsibility to appoint a successor to serve for the duration of the unexpired term. The June 14, 2017 resignation of Mark Peterson from the position of District Attorney created a vacancy that would extend until the current term of office expires on January 7, 2019. The next election for the District Attorney will take place in June of 2018, with a potential runoff election in November of 2018. The Office of District Attorney is provided in the State Constitution. The District Attorney represents the people of the County in prosecuting all public offenses in the Superior Courts, including all felonies, misdemeanors, juvenile criminal offenses, and certain civil offenses, including high-tech crimes, environmental crimes, and many instances of fraud. Although the Board of Supervisors has discretion in how to fill the position, there are some minimum requirements for the job. 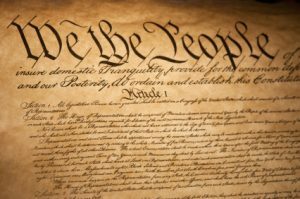 To qualify, a candidate must be at least 18 years old, a California citizen, a registered voter in Contra Costa County at the time of appointment, and admitted to practice law in the California Supreme Court. The Board of Supervisors is seeking candidates with experience in criminal law, familiarity with criminal justice issues in California, and the ability to effectively manage a County department with an annual budget of $19.5 million and more than 200 employees. All applicants must apply online at www.cccounty.us/hr and submit the information as indicated on the job announcement no later than 5:00 p.m. on Friday, July 21, 2017. NOTE that a background investigation/fingerprint exam will be conducted on all finalists, and a permanent job offer is additionally contingent upon the successful completion of a thorough background investigation, which will include a criminal records investigation and an economic disclosure (FPPC Form 700). The legislature does not specify a deadline for making an appointment like this, but according to the California Attorney General, the appointment should be made within a “reasonable time.” With applications due July 21, the Board of Supervisors will select finalists in early August. The Board of Supervisors will host a moderated candidate forum at 6:00 p.m. on Tuesday, August 15, 2017. Members of the public will be invited to submit questions for consideration that may be asked of the finalist candidates. The Board will interview those candidates during a public meeting on Tuesday, September 12, with the goal of making a selection in September as well. The June 23 meeting of the Board of Supervisors is available online in the video library found on the County’s homepage at www.ContraCosta.CA.gov. It will also be replayed in its entirety on Sunday, June 25, at 6:00 p.m., Monday, June 26, at 5:00 p.m., and Thursday, June 29, at 6:00 p.m. on Contra Costa Television (CCTV.) CCTV can be viewed on Comcast Channel 27, Wave Channel 32, and AT&T U-Verse on Channel 99.